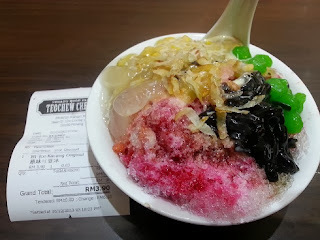 Ais kachang... I am weird ok.. I do NOT like kachang or beans or nuts unless they are just nuts and I am in the mood for nuts and ais kachang do freak me out some times in some places.... with the colour and presentation looking like a horror story. When I was in Penang, just before heading back here to KL, I couldn't resist a bowl of the Teochew ais kachang... made to order , naturally...minus beans and nuts to the amusement of the proprietor but she indulged me when I asked for extra evaporated milk and some nutmeg on it..... and oh gosh.... it was just heavenly!!! !